BASE: Combine all ingredients for the base in a food processor until the texture of fine crumbs and press into baking a tin lined with non-stick paper. MINT FILLING: Blend all ingredients for the mint filling on high speed until smooth and pour on top of the base. Set in the freezer for 4 hours or overnight. Once set, remove from the freezer. 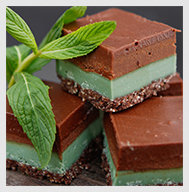 CHOC FILLING: Blend all ingredients for chocolate topping until smooth and pour on top of the mint layer.